The Sutherland was developed and produced by Victory Gardens Theater in Chicago in 1997. 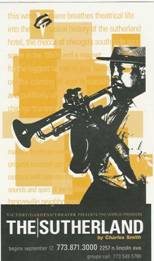 The world premiere production of the play, which is loosely based upon the life of Chicago jazz trumpeter Malachi Thompson, featured music composed and performed live by Malachi Thompson. A promising young musician, Eugene Taylor, comes of age in the midst of Chicago’s Southside jazz scene of the 1950’s with musical royalty Miles Davis, Duke Ellington and John Coltrane as his role models. Having embarked on a six month European tour, he returns 15 years later after being seduced by the European’s appreciation of jazz and the love of a Viennese woman. While abroad he hears of the race riots of the sixties, but not until he returns does he witnesses the devastating results; the black flight to the suburbs and the decline of the inner city neighborhood which was once his home. In a move to resolve both his absence and his current existence, Eugene goes on a crusade to save the Sutherland Show Lounge, once a mecca of Chicago’s south side jazz scene. The Sutherland is available through Samuel French, Inc. Original first drafts, intermediate drafts, final and/or published drafts of this play are part of the DePaul University Library’s Special Collections Archives Division, 2000. Set requirements: Unit Set, various locations.